To fully appreciate this story, you must understand the magnitude of suffering inside the beaten city of Berlin back then. 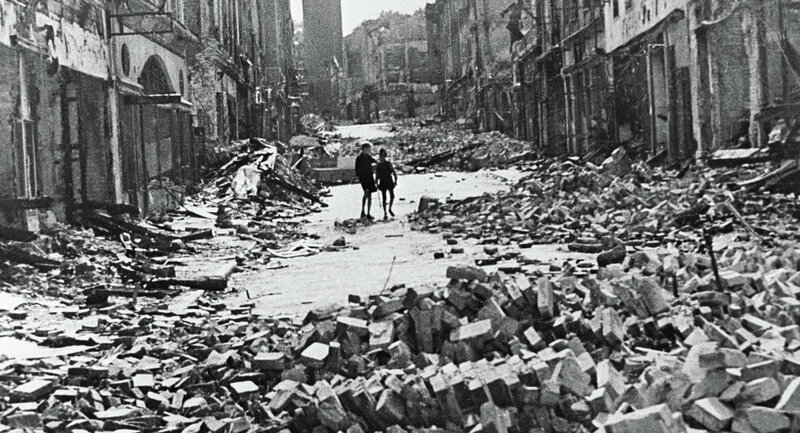 In the final two years of World War II, Germany’s capital endured more than 360 air raids. What bombers didn’t destroy, Soviet artillery and tanks did when they arrived in April 1945. When the guns fell silent, the once beautiful city was nothing but piles of shattered brick, twisted steel, and broken glass. There was no electricity or telephone service. No running water. And worst of all, no food. The victorious Allies divided the conquered capital into four sectors, one each controlled by the Americans, British, French, and Soviet Union. They divided Germany itself in half with the Soviets calling the shots in the eastern portion and the three western Allies in the west. Berlin was deep inside the Soviet part. That annoyed Soviet dictator Josef Stalin, who wanted complete control of Berlin. For three years, the western Allies shipped food and supplies to Berliners by truck, rail and canal boat through Soviet-occupied territory. 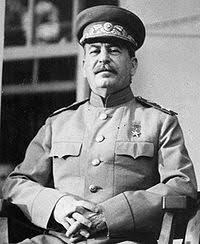 Without warning, Stalin blocked all routes into Berlin on June 24, 1948. By starving Berliners, he believed, he could bully the western Allies into accepting his post-war plans for Germany. 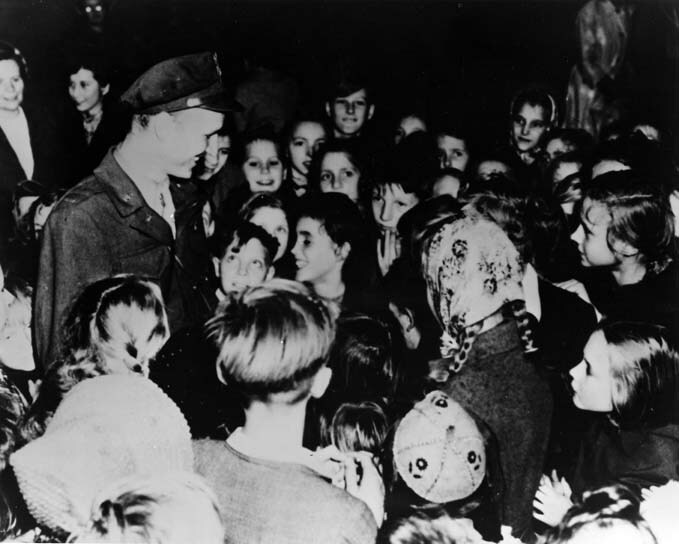 And the Candy Bomber brought something special for Berlin’s children. It started innocently enough. 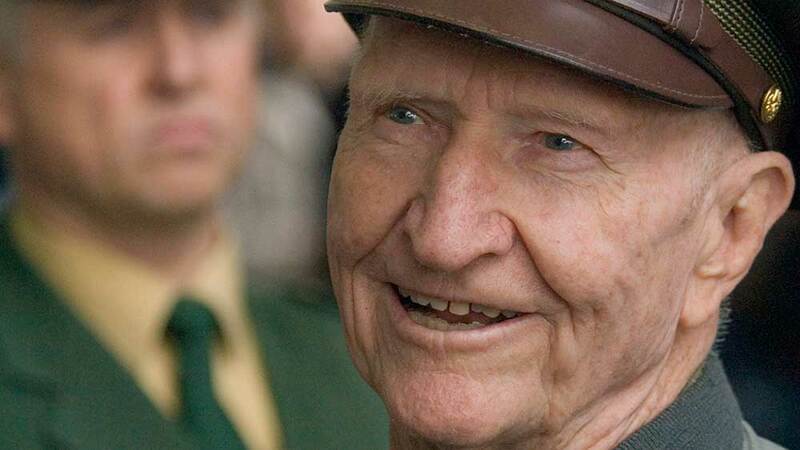 Lieutenant Gail Halvorsen served on one of the C-54 cargo planes that ferried supplies to the beleaguered city. The 27 year-old was also a shutterbug. One day he visited busy Templehof Airport to snap pictures. While watching planes take off and land, he noticed about 30 children standing behind a barbed-wire fence and thought about all the suffering they had endured in their young lives. He walked over and struck up a conversation. The kids told him they were grateful for the lifesaving help Halvorsen and the others were bringing. Touched by their gratitude, he took two pieces of chewing gum out of his pocket and handed them over. 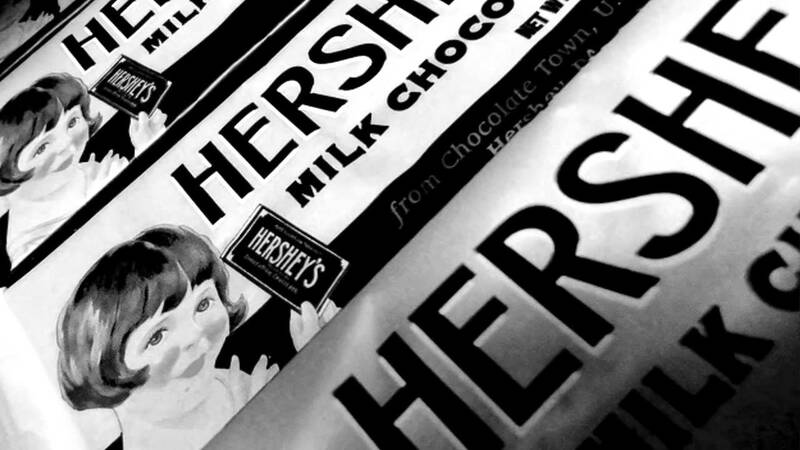 The youngsters tore them into tiny bits and passed them around; those who went without inhaled the scent off the wrappers. Halvorsen felt sorry he didn’t have more treats to share. He promised the kids he would drop enough gum for all of them out his plane the next day. How would they know which plane was his, the excited youngsters asked. He promised to wiggle his plane’s wings (a gesture he had done for his parents when they watched him fly in 1941). Halvorsen and his crew pooled their candy rations that night. There was so much, he needed three handkerchiefs to make parachutes to land it. Sure enough, the kids were waiting the next day. Halvorsen and his men felt so good, they made weekly drops for the next two weeks. 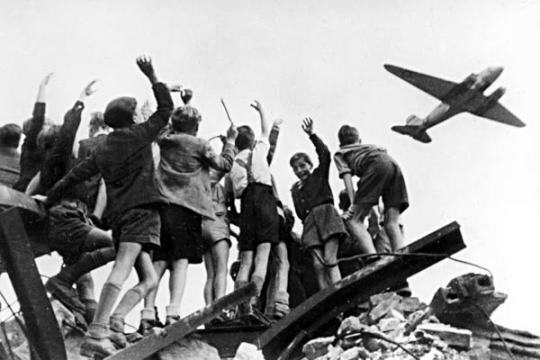 Each time, the crowd of children waiting below grew larger. The big brass eventually got wind of what “Uncle Wiggly Wings” (as the German children called him) was doing. Far from being upset, Lt. General William Tunner loved the idea! Halvorsen was greatly relieved to learn he wasn’t in trouble. Now called “Operation Little Vittles,” the candy drops expanded. Word spread among Halvorsen’s friends, then the entire squadron, until finally reaching stateside. American kids and candy makers donated so many sweets that Halvorsen couldn’t keep up with it. So a Massachusetts college student volunteer took charge of things. Working with the National Confectioner’s Association to keep the candy and gum coming, there eventually was so much the drops came every other day. Stalin finally gave in and lifted his blockade. 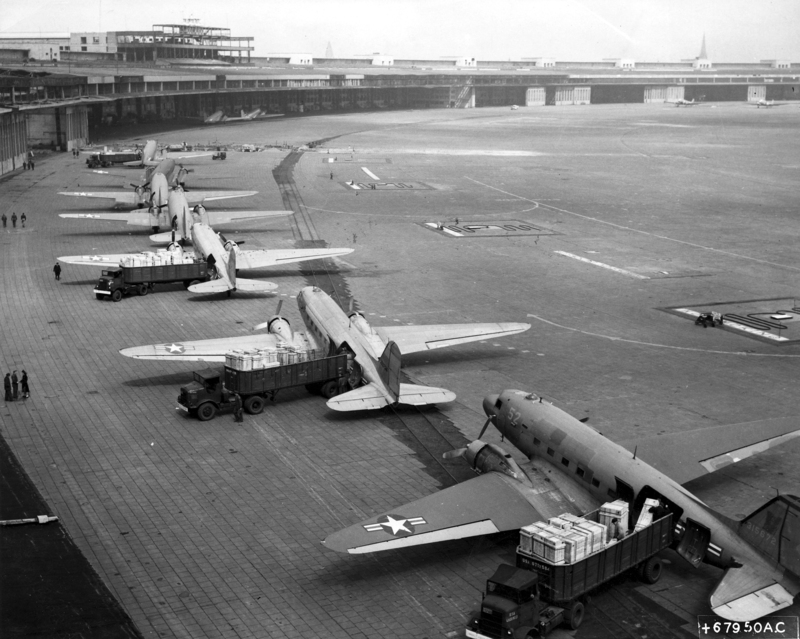 The Berlin Airlift, both “Operation Vittles” and “Operation Little Vittles,” concluded on May 13, 1949. Some 23 tons of candy had been dropped by over 250,000 handkerchief parachutes. Most importantly, thousands of needy children learned their former enemies now cared about them. As of this writing, Halvorsen is 98 years-old and still enjoys telling audiences how one simple act of kindness wound up touching so many lives. “Operation Little Vittles” succeeded in more ways than one. What a great story!! I’d never heard about Operation Little Vittles. So glad I know now – I’ll be sure to share it. Glad you enjoyed it Trish! Thanks for writing.